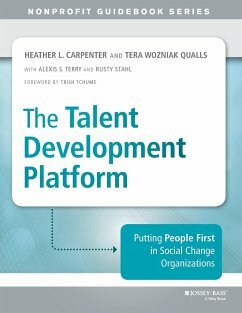 Putting People First in Social Change Organizations The Talent Development Platform is about results driven talent development for social change. Written by seasoned nonprofit experts, this book provides a holistic process for creating an in-house training and talent development program. 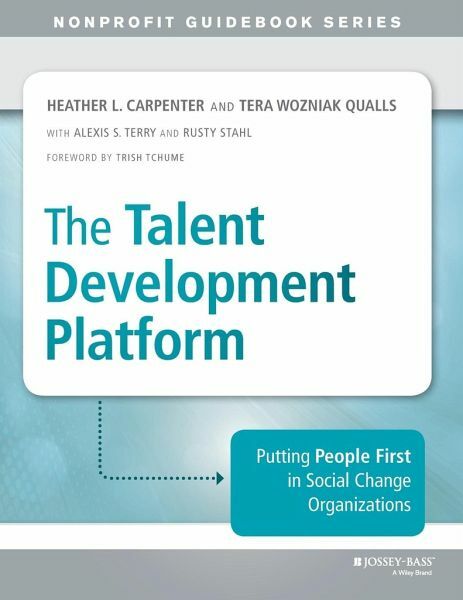 The Talent Development Platform offers organizations the tools for ensuring their professional development systems are successful through regular feedback loops, tailored for learning styles, and specific to their organization. Detailed case studies provide insight into the strategies used by organizations that have implemented the Talent Development Platform, and interviews with experts in the field give readers a handle on the most current thinking. Robust resource guides facilitate the talent development process, and online access to the Talent Development Platform and assessments help streamline the workflow. Social change organizations make the most of limited resources, but often overlook developing the talent they already have. This book gives readers a plan for finding and nurturing their internal talent to reduce turnover and improve organizational efficiency. More specifically the book helps organizations: * Develop organizational, department, and position specific competencies. * Create and revise job descriptions. * Assess staff and volunteer proficiency levels with created competencies. * Determine staff and volunteer learning styles. * Establish professional development goals and objectives tied to strategic goals. * Implement professional development with on the job learning, mentoring, and training. * Calculate a return on talent investment. * Evaluate talent development implementation and proficiency level changes. Implementing the Talent Development Platform provides organizations with tangible benefits in the form of lower turnover and greater output (without the burnout) from employees and volunteers, as well as intangible benefits that make organizations more attractive to top talent. HEATHER L. CARPENTER, PHD, is assistant professor of Nonprofit Management at Grand Valley State University in Grand Rapids, Michigan. She teaches graduate and undergraduate courses in Nonprofit Management, Human Resources, Financial Management, Fundraising, Technology, and Volunteerism. TERA WOZNIAK QUALLS, M.P.A.,is founder of Momentum, a nonprofit consulting firm focused on strategic planning and talent development for nonprofits. Tera also serves as an adjunct professor of nonprofit administration in the School of Public, Nonprofit, and Health Administration at Grand Valley, where she teaches introduction to nonprofits and volunteerism for undergraduate students.